Being dead, zombies can wind up being a host to a variety of other organisms, including vermin and insects. The Spider in Mouth Zombie Mask depicts a gruesome and ghoulish skeletal zombie with a large, gray spider in its jaws. Is the spider a resident of the zombies skeletal visage, or is it the only meal this zombie could find? The former seems more likely, given that zombies prefer human flesh to any other. This impressive mask depicts a very skeletal zombie whose flesh has sunken in so far against its skull that it seems to only be a skull. Its face is cracked in places and the zombie is missing its nose, its eyes, and its lips, leaving only a skeletal grin. Gray hair hangs from the side of the zombies head. In the zombies mouth is a large, gray spider, its three fore legs wrapped around the zombies lower jaw, while its hind legs reach up as if holding the zombies mouth open. 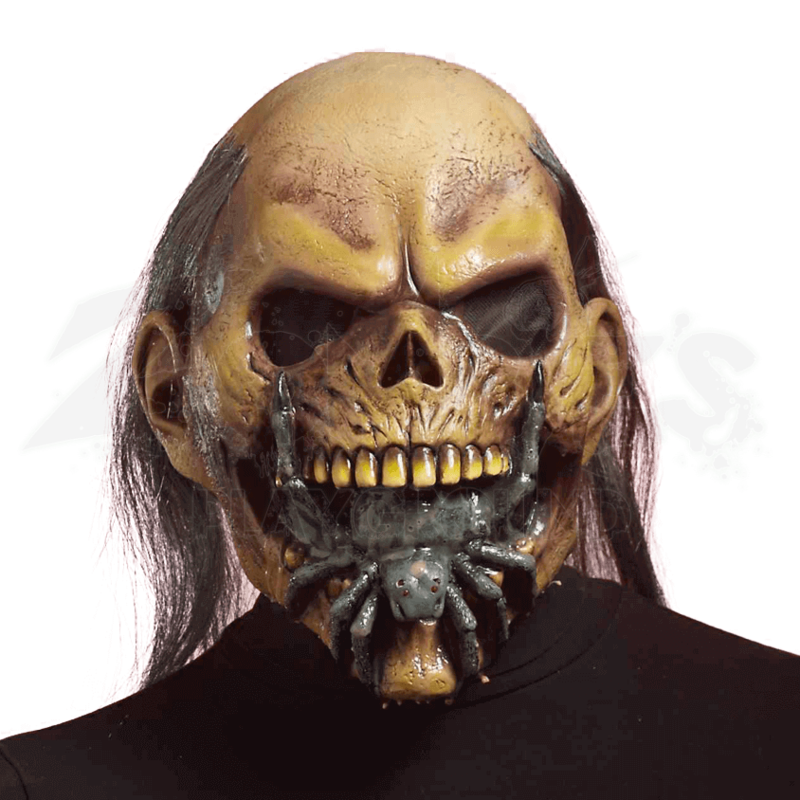 This grisly face-mask covers the whole head and features a fine black mesh that covers the eyes, while allowing the wearer to see out with ease. Featuring an impressive double-dose of terror, the Spider in Mouth Zombie Mask is a great piece that can be combined with virtually any zombie look or style to create a ghoulish undead that will have survivors running whenever you shamble their way.